I was born, but like everyone else don't remember any of the details of the event. My mom was in vaudeville for a time and although we weren't well off there was always music playing on the radio, or mom singing a bit here and there. Early youth on Rockaway Beach with all the folks from Manhattan taking the subway and bringing their bongos and trumpets and guitars and congas to spend the summer day near the water playing and having fun was simply a seminal influence showing me how music is entwined with life itself. It wasn't until much later, when I was sixteen, that I received my first drum kit and began lessons with one of the professors at Peabody Institute in Baltimore. Was in many bands, none of which had writing original music as their primary goal with the usual result. Overall I'd say my music tends to be going somewhere, it may not get there quickly necessarily, but the music is atmospheric and evolving, and within that there is all this stuff going on that not only propels it along, but addresses a need in the listener to become still and yet move with the flow. While listening something unexpected may emerge: textures, melodies, layered rhythms, voicings, sounds, effects; all contribute to the sound image I am pursuing, where the image is far from static and evoking it musically is the game of the moment. There are enormous amounts of influences that found their way into my psyche and consequently, the album. I studied drums for a time with jazz great Alan Dawson and learned tabla from Pandit Shashi Nayak, so the rhythmic element comes in all the time. Having been in the Boston area for over 30 years now, I've been exposed to a myriad of musical genres and styles. I've seen Weather Report, Miles Davis, Pat Metheny, King Crimson, Bill Frisell, Dave Weckl, Bill Evans. experimental electronic music, gamelon orchestras, Chinese and Tibetan troubadours, great folk artists like Patty Larkin and John Gorka, not to mention The Boston Symphony. I feel enormous inspiration anytime I hear Robert Wyatt, and was a Soft Machine fan from day one (saw them in Baltimore with Jimi Hendrix, also a huge influence). The Beatles (nuff said). ESP Studio where the music emerges, Expanding Sky Music, my publishing company, and an ever growing network of artists both musical, visual, physical (as in healing arts), and spiritual have come together to begin what I hope will be a very interesting, challenging, and rewarding movement together. Fascinatingly unique, Heart of Matter engages the listener..
Pulsing with energy and feeling, Heart of Matter soars, grooves, and uplifts. Heart of Matter is a soaring album that brings a textured, grooving, downtempo approach to richly layered and beautifully rendered melodies. All of the elements are gorgeously musical, from drum grooves to bass melodies, to synth riffs, to searing guitar solos. The album pulses with an irresistable energy that both inspires and uplifts. It is at once, deeply reflective and truly propulsive. From beginning to end, the album is wonder. I can't stop playing it. really great album - can't believe he played everything! This is a really great album - it is amazing that Michael composed and played everything (except for 2 guest guitar solos). I am not usually a huge fan of Ambient music (i do love words) but this cd has opend my mind and ears to new sensations. I feel that where many Ambient musicians do not satisfy is that they do not understand the possibilities of rhythm or pulse. As a Bass player, the first part of any piece i usually focus on is the Bass line - if that is good, then we are off to a good start! Not only do we have great, solid, supportive, melodic Bass lines - we also hear really wonderful percussion (some reminiscent of Jack De Johnette airyness and some parts with cracking, locked tight, solid grooves). Added to that foundation is some impressive keyboard work: tinkling Fender Rhodes, ethereal synth patches and some soprano-sax like solo work - plus some really great gritty guitar sounds, with melodies that turn to unexpected places. Here we have one of those albums that without which, any collection is incomplete. There is not a weak spot on the album - it is remarkably satisfying throughout. This is the real deal - truely inspired music! but it was well worth the wait !!!!!!!!!!!!! a GrIndie Award for their CD \"Heart of Matter.\" A GrIndie Award is RadioIndy\'s stamp of approval that this CD is an excellent quality CD. Please join us in congratulating this artist on this accomplishment. 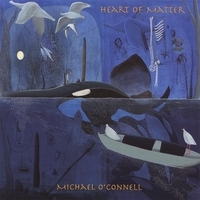 "Heart of Matter" by Michael O'Connell is a dreamy Electronica album that features dynamic grooves and lush textures. The songs are all very unpredictable and feature very emotion-conscious arrangements. There is a nice mix of organic and synthetic instruments. The album is well mixed and flows nicely from track to track. The vibe is mellow and will relax you while it stimulates your mind. Highlights include the opener "Liquid Clouds Suite," which sets the table nicely with big ambient synths that transition into a fluid and intelligent sequence. "Red Horizon" showcases a few more organic instruments (including electric guitar), and has a soft, but driving beat. "Dark Moon Transit" opens with a wicked beat and wraps the album up well with a great sense of closure. If you enjoy nicely flowing Electronica music, check out this CD. Really nice and peacefull and seems to me I listen to this music all day. the sounds of your record machines? ?